Is anybody reading all the weird stuff that’s going on with Venom these days? I understand it’s some noteworthy stuff, and it’s getting a lot of buzz on these here internets, but I can’t bring myself to care — and the movie is only two weeks away! Would anybody mind letting me know in the comments if it’s been worthwhile or not? Thanks! I’ve mostly been sticking with comics I already love and adore, which is great for my general well being! Tom King on both Mister Miracle and Batman? Yes, please! Kelly Thompson on both Mr. and Mrs. X and West Coast Avengers? You’re damn right! Mister Miracle wins Comic Book of the Week as we dive headfirst into the climax of one of the biggest, craziest comics of the year! Crazy with a capital “C”! Meanwhile, I am completely ignoring the Return of Wolverine and the Infinity Warps stuff. Part of me knows they’re probably OK, and I’m sure the creative teams are great, but I have had my fill of Marvel’s attempts to either force Big Event comics to tie into recent movies, or deluge us with bringing Wolverine back, even though they made sure he wasn’t really gone anyway. There’s already been, like, several dozen different comics about Wolverine’s return. Just bring him back already, jeez louise! I can’t imagine there is anybody out there who is chomping at the bit to have regular Wolverine back so badly. Comic Reviews: Batman #55, Mister Miracle #11, Mr. & Mrs. X #3, Multiple Man #4 and West Coast Avengers #2. It’s Kelly Thompson Week! This lady is on fire at Marvel right now, and we get two of her books this week, Mr. & Mrs. X and West Coast Avengers! That’s pretty darn awesome! We’ve also got more Superman and Spider-Man comics, but who cares about them? 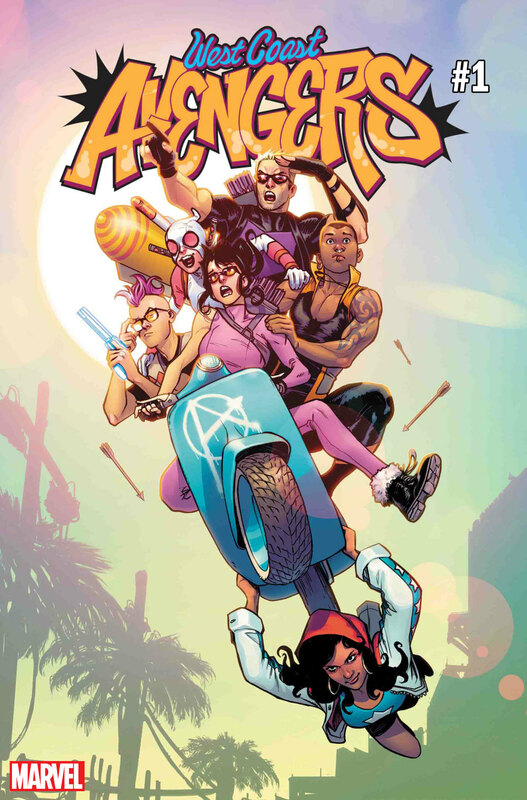 Comic Book of the Week goes to the first issue of Thompson’s new West Coast Avengers for a really fun team book that doesn’t waste any time — though I had more than a few nitpicky problems. Land sharks, and the two Hawkeyes arguing about oceanography, is pure Thompson style! Fair warning, everybody, I was apparently in fine form writing these reviews this week. Nothing particularly stood out as all that great, while I found so much to nitpick to death, including in some of my favorite comics! Comic Reviews: Action Comics #1001, Amazing Spider-Man #4, Mr. & Mrs. X #2, The Silencer #8 and West Coast Avengers #1. 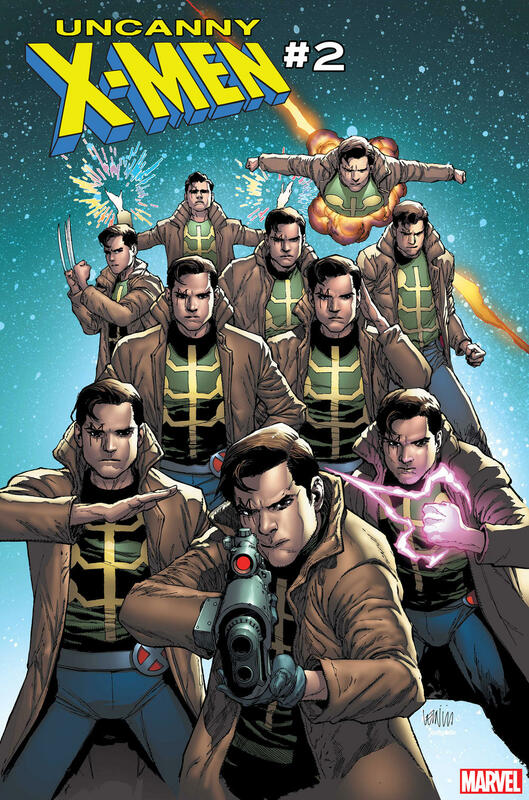 It’s a good time to be a Multiple Man fan, let me tell you. Not only is there a comic coming out called ‘Multiple Man’ for the first time in history, but he’s also apparently going to be a big player in the upcoming Uncanny X-Men title revival. The cover of Uncanny X-Men #2 was revealed on Wednesday, along with an interview with writer Kelly Thompson. You’ll notice again that Jamie Madrox has the ‘M’ tattoo over his eye, indicating that this could be Madrox Prime, and not the dupe that’s currently starring in the Multiple Man comic. 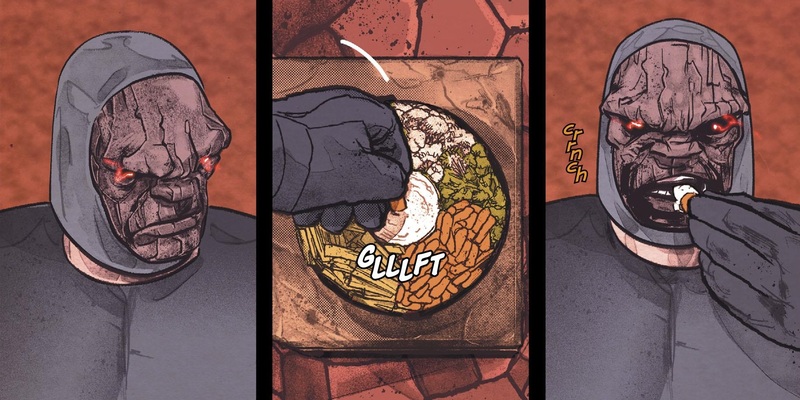 So consider me definitely getting my hopes up at this point that Madrox Prime is coming back to life somehow, and he’ll be a player in Uncanny X-Men. I’m also willing to believe that Marvel would just kill him over again just to spite me. The Madrox cover is a take on the cover of Uncanny X-Men #1, which possibly features the roster for the team. We’ll find out in November! OK, so we’ve known for a bit now that the Uncanny X-Men title was coming back to print this fall. As I’ve mentioned before on this blog, Marvel loves relaunching the X-Men with an entirely new status quo every two years or so. I call it the X-Men Assembly Line. 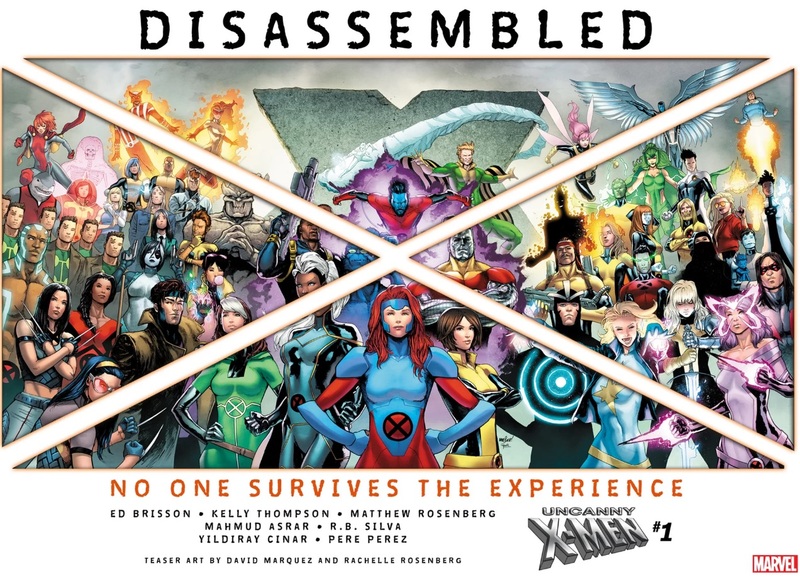 And the next major twist has been announced, kicking off with the 10-part Disassembled. I’m not all that excited by this relaunch, at least not until we know more about what’s going to happen. I like the general idea, at least. I think the X-Men are long overdue for an overhaul. The fat needs to be trimmed, and I hope this Disassembled thing is that fat-trimming. You can read more about the whole thing at Marvel. Kelly Thompson is indeed going to be a major player in the X-Men franchise. This is awesome news! She’s the excellent writer behind all the great Rogue & Gambit stuff we’ve been seeing. The Multiple Man in that picture has the “M” tattoo over his eye. The currently alive Jamie Madrox over in the Multiple Man comic is a dupe who does not have the “M” tattoo over his eye. Could this mean that Jamie Prime will be back by Disassembled? I’m hopeful! Where the heck is Strong Guy? I have been dutifully on Strong Guy Watch for awhile now, and I’m disappointed that this is a big X-Men group shot and he’s not hiding in the background somewhere! That’s his thing right now! Whatever happens with Disassembled, I will at least check it out. Hopefully the rest of you are more excited than I am. There’s Gonna Be a New West Coast Avengers! This is some great comic book news! 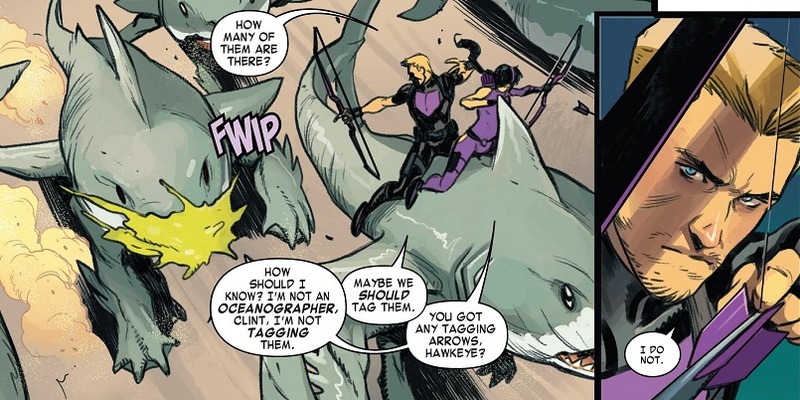 Writer Kelly Thompson is going to write a new West Coast Avengers comic, starring Hawkeye, America Chavez, Gwenpool, Quentin Quire, Hawkeye, and that guy who was hurriedly revealed to have super-powers at the end of Thompson’s Hawkeye comic! This has me really excited. Thompson is phenomenal on comics. 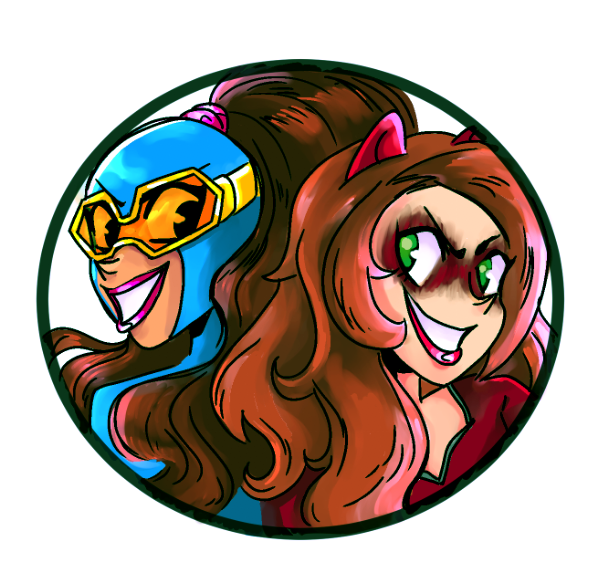 I’ve loved both her Hawkeye and her Rogue & Gambit comics. So I think a team of awesome Thompson-esque characters trying to play at being the West Coast Avengers sounds like fun to me! I definitely have to finish reading all the Gwenpool comics before this comes out. Also, this may just be me, but I find it slightly silly that Johnny is part of the team. He’s a Thompson-created character, so she’s more than welcome to use him, but he was a little silly in the Hawkeye series. Basically, the comic got cancelled before Thompson really had a chance to play up the romance subplots she was working on. So in the last couple of issues, she not only quickly hooked up Kate and Johnny with, like, a single kiss. But she also introduced the idea that Johnny could turn into rocks or something. She was forced to rush through everything she wanted to do with Johnny in, like, the last issue. It was funny. And now he’s back! So good for Thompson and Johnny! The first issue comes out at the end of August!